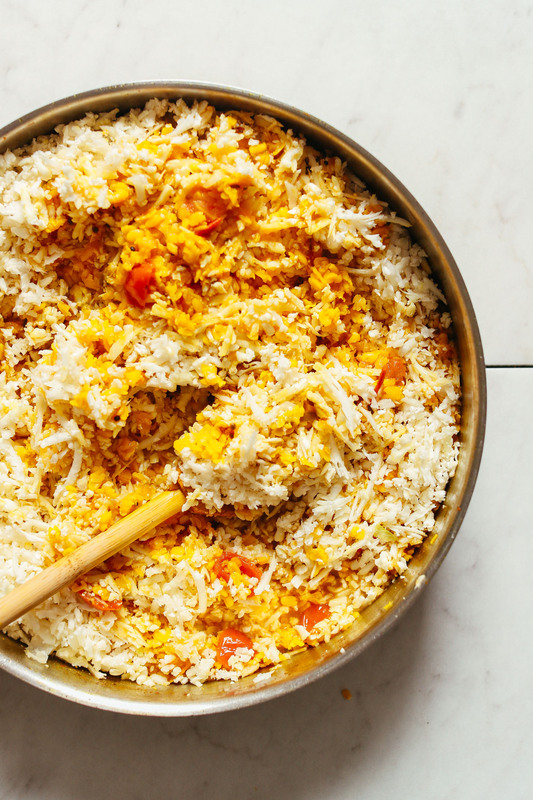 Our inspired take on this flavorful dish uses cauliflower rice in place of basmati rice and can be served atop greens, grains, or roasted vegetables. It’s perfect for just about any occasion (whether you’re sick or not). Let us show you how easy this 1-pot meal is. The one time-consuming thing about this recipe is that you need to soak your moong dal – a.k.a. split mung beans – beforehand, which takes about 6-8 hours. This increases the digestibility and speeds up cooking time. Once soaked, it’s smooth sailing. It all starts with toasting your whole spices along with fresh ginger, serrano pepper, and diced tomato. Next comes the soaked moong dal, which is sautéed and then simmered in water until tender. Once tender, it’s time to add your cauliflower rice and more spices for big flavor. (We also include an option for basmati rice in the notes if you’re down with grains). Cover and simmer until all of the flavors meld, and before you know it, dinner is on the table. We did it! You did it. Friends, we did it. This is the perfect dish to make ahead of time and reheat throughout the week. It just gets better with time. Make it for yourself or loved ones who are sick – it’s like a hug. Make it for dinner parties. Your friends will love you for it. 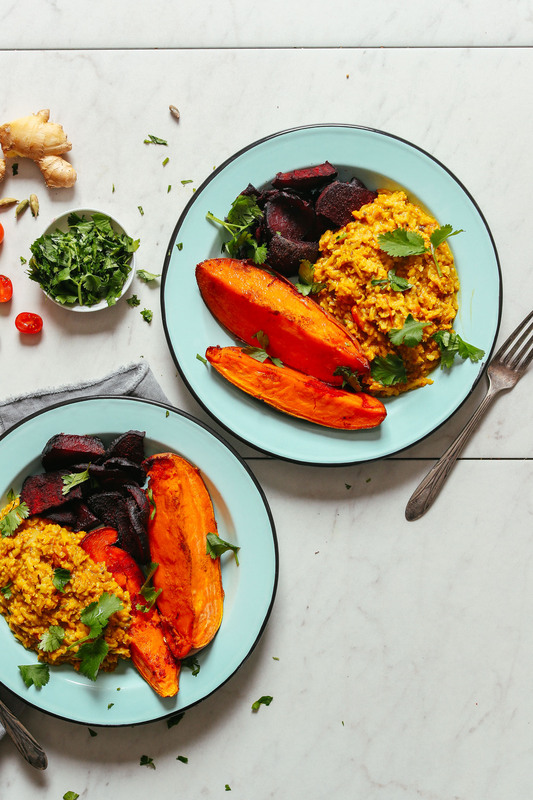 Our favorite way to enjoy it is with roasted sweet potatoes and beets – because carbs – and some fresh cilantro. Take it to another level with this green curry tahini dressing. Swoon! For more comforting dishes, be sure to check out our 1-Pot Lentil Chili, Lentil Mushroom Stew over Mashed Potatoes, Creamy Vegetable Risotto, 1-Pot Minestrone Soup, and Lentil Sweet Potato Shepherd’s Pie. A hearty 1-pot meal of kitchari - a traditional Ayurvedic dish for when comfort food is on the brain. Easy to digest and incredibly soothing, our inspired take on this flavorful dish can be served atop greens, grains, or roasted vegetables. Add moong dal (or chana dal) to a large pot or skillet and cover with cool water. Soak overnight (or for 6 hours). Once soaked, rinse and drain. Set aside in strainer. Heat the same large pot or rimmed skillet over medium heat. Once hot, add oil (or water), cumin seed, mustard seed, ginger, serrano peppers, asafoetida*, and tomatoes. Sauté for a few minutes, stirring occasionally (see photo). Next, add moong dal and sauté for a few minutes, stirring occasionally. Then add water, clove (optional), and cardamom (optional). Increase heat and bring to a low boil. Then reduce heat to a simmer, cover, and cook until moong dal is tender - about 15-20 minutes. Add cauliflower rice, garam masala, cumin, turmeric, coconut aminos, and sea salt and stir to combine (see photo). Cover and cook until cauliflower rice is tender, about 10-15 minutes, stirring occasionally. If the mixture becomes too dry, add more water (you’re going for the texture in the photo). Add coconut milk at this time for creamier texture (optional). Taste and adjust flavor as needed, adding more salt for saltiness, coconut aminos for depth of flavor, cumin for smokiness, or garam masala for curry flavor. Serve as is or over rice, greens, or roasted vegetables. We love this kitchari with roasted beets, sweet potatoes, cilantro, and this Tahini-Curry Paste Dressing. Store leftovers in the refrigerator up to 5 days or in the freezer up to 1 month. Reheat in the microwave or on the stovetop. Add more water or coconut milk if dry. *Asafoetida is a seasoning commonly used in place of onion and garlic, both of which can be aggravating and stimulating to our digestive system, according to Ayurvedic principles. Because it is not a common spice, you can sub 2 cloves minced garlic and 1 minced shallot per 1/4 tsp asafoetida. Add to the recipe when cooking the spices and pepper. Just know that using asafoetida is the more traditional way to prepare kitchari. *For a more traditional approach, you can sub 1/2 cup dry (92 g) basmati rice per 2 cups cauliflower rice. If going this route, add to the pan at the same time as the moong dal. You'll likely need to add more water - start with 1/2 cup (120 ml) and work up from there. *Recipe adapted loosely from Ascension Kitchen. *Prep time reflects soaking beans and prepping ingredients. Just made for dinner. While I was making, the Hubby was skeptical but he actually went up for a SECOND serving. I had no doubts this was going to be delicious and it was 100% was! I didn’t have all the spices and it still came out so tasty. Enough for leftovers for the week. Thanks! Another amazing recipe. 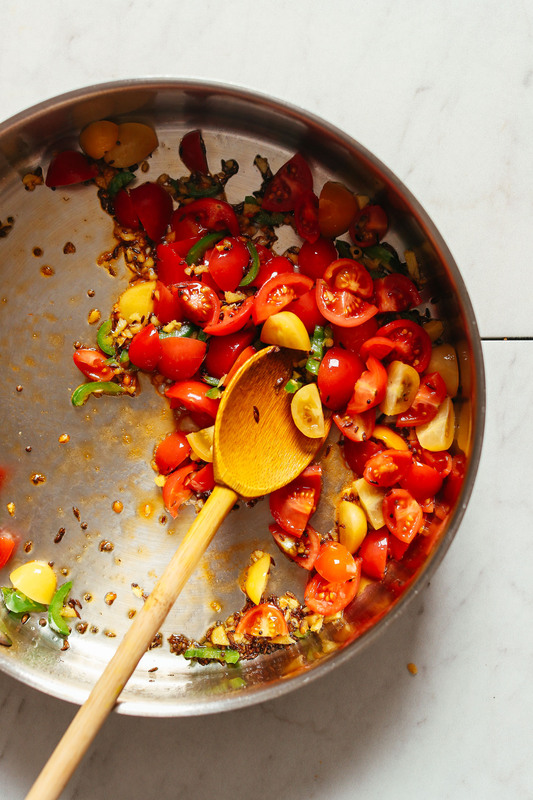 Looking forward to making this in a few days… might be a silly question but does it matter what kind of tomatoes I use? Great recipe, Dana! 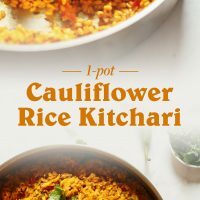 I was looking for something to make with cauliflower, and found this one and it was perfect! I had it with roasted sweet potatoes and cashew cream. It tasted even better next day. I’ll be making this one again. We’re so glad you enjoyed the recipe, Andrea! My boyfriend who is not a fan of cauliflower rice but is a fan of Indian food loved it. I was so surprised by how all the flavors came together and really did feel like comfort food. We substituted jalapeño peppers for serrano ones, and only didn’t have like one or two ingredients and it still turned out sooooo yummy. It’s Thursday and we’re still talking about Monday nights dinner. Thank you for the great recipe and directions! Yay! Thanks for sharing, Marina! I found the mustard flavour to be overpowering. I added a bunch of sweetener to help over come that. Looks so good/healing! Do you think this would work with black beluga lentils, or are those too slow cooking? We haven’t tried with black beluga lentils and can’t say for sure but if you experiment with them, report back on how it goes! Good luck! Can’t wait to try this! If I have whole mung beans on hand instead of the mung dal, can I swap that in & how would I adjust the ratio? I assume I’d have to cook for longer? Thank you! Hi … yes, can use whole moong beans. We make khitchdi once a week with whole moong. Same ratio is fine, just need to cook for slightly longer. Perfect, thank you for the reply! Just a heads up that asafoetida is NOT gluten free. The version I got is! Just have to be careful and read the labels. Made this two nights ago. We have been trying variations of Indian food every Thursday in my house, everyone really enjoyed the flavor! I used pre-made cauliflower rice, it worked fine. I would like to try the green curry tahini dressing with it next time! Thank you for the recipe Dana! Yay! We are so glad to hear it! Thanks for the great recipe, can’t wait to try it! I’m Indian and enjoy khichdi, i do consider it be comfort food for me, but more for the taste and not because of Ayurvedic properties or anything. 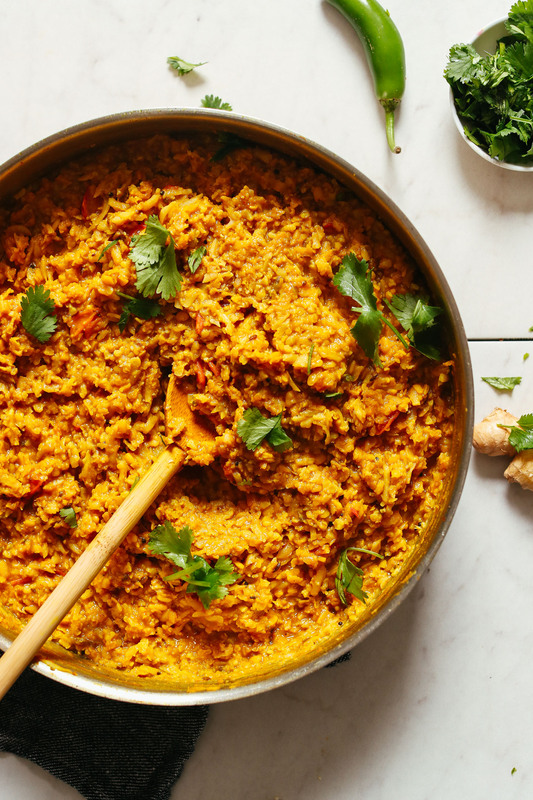 I don’t eat ghee anymore and am trying to cut down on my rice intake, so this recipe is perfect for those of us who enjoy the flavors of this dish but want to make it healthier. Thank you for thinking of this! We hope you love it, Kalpa! Excellent recipe!!! I recommend using all the spices and topping the Kitchari off with her green curry dressing!! Thank you so much for all you share. Lovely! Thanks for sharing, Randy! I made this tonight. I wasn’t sick so I can’t vouch for its healing properties but it was certainly comforting and very very delicious! Dana your recipes have never failed me! I often find lentils and rice very heavy together but the cauliflower meant it was so digestible and light whilst feeling very nourishing. The only thing I would have done would be cook it longer at the end for fuller flavour. Being a Brit, I LOVE Indian food. The flavors and spice call to me often. I made this last night – unfortunately I thought I had moong dal but didn’t so used urad dal instead. It took much longer to cook and didn’t really absorb all the water so I had to boil a lot of it away. Also I bought cauliflower rice pre riced so went by the cup measurements and unlike many others here it made way too little! It was delicious. I made the suggested thai green curry dressing (which I was skeptical about because it is so untraditional compared to the one I normally make) but I loved it! Had the tiny amount of leftovers in my lunch at work today and wasn’t as good cold as I was hoping but still a great dish. Will definitely make it again. Next time with Moong dal!!!! Lovely! Thanks for sharing, Natalie! I soaked the moong dal overnight. I used the 2 cups of water. There was way too much water after cooking 15 minutes. I did the rest of the cooking with the lid off to dry it out. It still is very wet, after cooking with the cauliflower, lid off. on the web the ratio of unsoaked moong dal to water is ¾ cup to 2 cups water. Tish, sorry about that! The water seemed to absorb well for us in that amount, especially when the cauliflower rice was added. However, if the moong dal is cooked and there’s still a lot of excess liquid, you can always drain that out as needed. Hope that helps! I made this recipe for friends as per recommendation of accompanies roast sweet potato and beetroot as well as the green curry and tahini dressing. It was very delicious, particularly the next day. I’ll certainly make this combo again, though I might try split red lentil next time as they are a favourite :) Thanks so much for the recipe! Oh yay! You made my go-to lunch lately. So glad you enjoyed it, Richelle! Okay, I made this with no preconceived ideas, having never heard of kitchari before. It made a massive amount—it just kept growing. I roasted Japanese sweet potatoes and golden beets. Sliced those and ladled maybe 1/3 cup of the kitchari over it. Seemed to need more layers, so added diced avocado, sunflower seeds, and cilantro. So we used less than one cup for the meal and have a quart and a half left over. It’ll be interesting to find things to do with it-breakfast, maybe? My husband liked it—very flavorful. I found the pre-digested texture off-putting but okay in combo with everything else. Ooh, I want to try this so badly! Would this recipe work with red lentils? Cassie, see my thoughts in the above comments! I like to make this for breakfast & never make it the same way twice. It’s a great way to use up veggies in the fridge. Thank you for the use of “cauliflower rice”. My husband doesn’t eat much rice, so the addition of cauliflower is a big help. It’s fun to eat outside the box: I’ve been making split pea soup for breakfast instead of bread/cereal. Lovely! Hope you love this one, Jeanne! Ha! These servings are definitely generous. Glad you enjoyed it! Hello all, any thoughts on doing this with frozen cauliflower rice? I know it wouldn’t be ideal but it may be reality. Thanks for your input! Wow I can’t wait to try this recipe :) Thanks for all the recipes & inspiration! It looks so delicious, I looove cauliflower, I so have to try this! Thank you for this recipe! Hi suggestion.. you can replace moong for masoor ie red split daal… its lighter n tastier… its actually orange in colour … i make both versions . Thanks Dana, For this Recipe…… in a new Avatar…besides a little check on the spelling of ‘Khichri”, I take no offense on this favorite Indian dish of mine. You clearly mentioned that you are making it with cauliflower rice. I am gonna try it asap..
On that note, whole of this week, we made and enjoyed your Immunity Smoothie presented in the Minimalist kitchen Book. Hi Raag! Thanks for the note! There seemed to be so many different spellings, so it’s nice to hear what is more traditional! Hope you love our inspired version. And so glad you enjoyed the immunity smoothie! So tickled to see kitchadi represented on your blog! What a smart way to incorporate more veggies. I am not a big fan of kitchadi myself, but I may have to try this since I bought Cauliflower rice in bulk from costco and this looks like a great way to incorporate its use (aside from smoothies and acai bowls). I am Indian too (2nd gen) but I have no problem with you calling it kitchadi. :) The ones I’ve been served have been made in a pressure cooker. Avni – I understand your feelings, but another way to look at this is she is bringing Indian healing foods to the forefront (and especially for those who may not be able to have so much rice). I am sure if anyone wanted to Google kichadi after reading this post they could and make it the traditional way with rice. In fact there are so many varieties of kitchadi, I like that there is just one more! Payal, thanks so much for the kind response! I appreciate your feedback and encouragement! This looks so great! Quick question… I don’t have any of the spices whole as you list in the recipe but I do have everything ground. Could you tell me amounts that I could sub ground for whole for the mustard seed, cumin seed (I noticed ground is actually used later in the recipe), whole cloves and whole cardamon pods? Ava, red lentils might be a little too quick cooking in this recipe and may become mushy. So I’d recommend green lentils if you can. 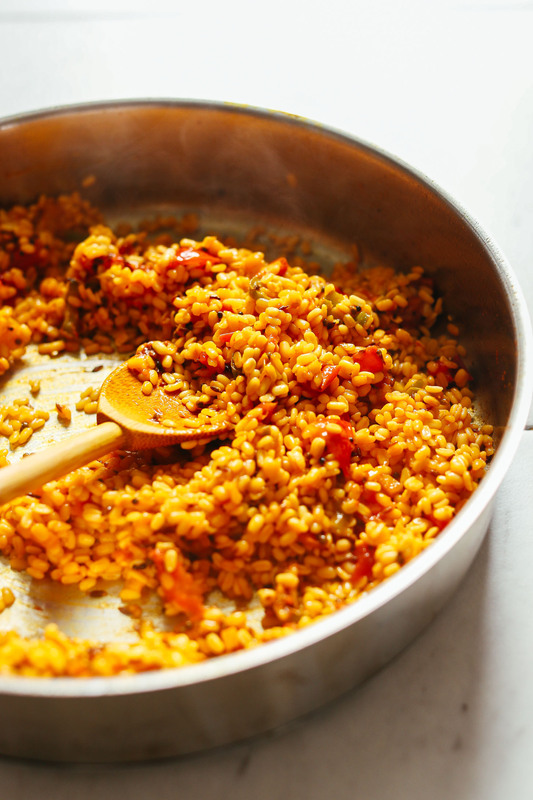 If using red lentils, just know they will cook very quickly and you’ll need to reduce the overall cooking time. Ok, I want to start by saying I love your blog and all the recipes, inspiration, and information that comes with it. That being said, this is just so wrong. I’m Indian and I’ve grown up eating “khichri” – it’s the ultimate comfort food, not just when you’re sick but also when it’s cold, when your tummy is acting up, etc. It’s the first “solid” food that’s given to babies. In Ayurveda, and when you practice Yoga and get more involved into the lifestyle aspects of the practice, this is a healing meal. BUT, that is only when you make it in the combination it is meant to be eaten in – dal(lentils) + rice + ghee. The ghee is what makes this meal have a low GI, making it easily digestible and soothes your tummy. 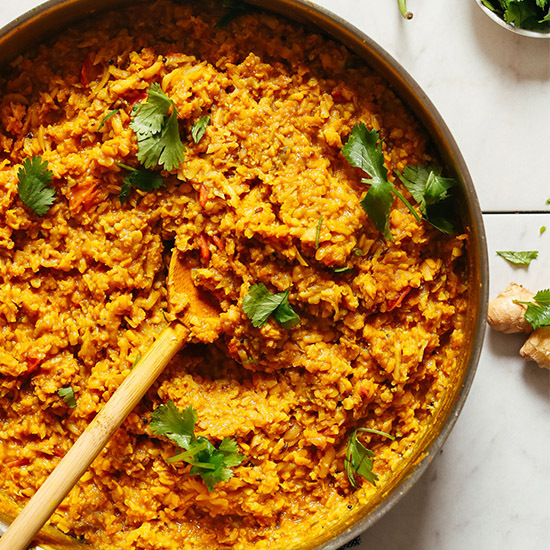 When you make “khichri” without ghee or without rice, you’re not making khichri anymore – it’s just a 1 pot lentil meal. I’m sure this recipe is great like most of your other recipes, but let’s please not call it khichri and misrepresent what this healing meal actually is for us Indians. I am Indian as well and agree with this comment. Cauliflower doesn’t make for easy digestion. I do love your other recipes though! Well she did specify that it’s *INSPIRED* by khichdi so I don’t think she was misrepresenting… I think it’s great, for posterity’s sake, that you clarified what this meal means to Indians but this blog is based on the premise of a plant-based lifestyle. There are a LOT of adaptation recipes on this blog that make traditional favorites (i.e. pizza) more approachable and diet-friendly. This is just another one of those recipes. If someone really wanted an authentic recipe (does that even exist for khichdi? ), I’m sure they could find one. Please let’s not discourage Dana from re-envisioning our Indian classics. Why not have as many awesome Indian recipes as we can, be they traditional recipes or fun new adaptations? I agree with you on that we should have as many Indian recipes as we can, be it traditional or new adaptations (that make it accessible to those following specific lifestyles or diets), and don’t get me wrong, my comment was by no means a discouragement of Dana re-envisioning our classics. However, with the amount of content that is written these days on khichri and it’s numerous benefits, I wanted to just bring to light that as delicious as this may be, you can’t be making this while expecting the same healing properties of a traditional Ayurvedic khichri! agree with Avni completely. pairing cauliflower with dal and calling it khichri is a no no – khichri is beneficial precisely because of the ingredients. Cauliflower is the worst thing one can ever eat when one is unwell – it is heavy on the system, creates a lot of “vata” or gas, can cause horrible stomach aches if one is already unwell.. So am afraid Avni is spot on – Kichri is always made with rice and dal only. Mostly Moong. If you substitute rice with anything else, it is only fair to alter the name. For instance, Khichri is also made with millets – it is called Bajra Khichdi or Millet Kichri.. Hence, the right thing for Dana would be to called it Khichri inspired Cauliflower rice khicri. and no, it is not eaten with socca or Besan / Chick pea inspired bread. Why not call this a “1 pot lentil and cauliflower rice”, or a heart warming “Indian inspired stew” or “1 pot Indian spiced lentils”? The fact that is is called khichri, when in fact, it has nothing to do with it, seems a bit of a stretch. It kind of feels like it’s borrowing from Indian culture and capitalising on the Ayurvedic lifestyle and diet trend, but without staying true to any of the origins. That, to me, is where the problem lies. I thought of this too! 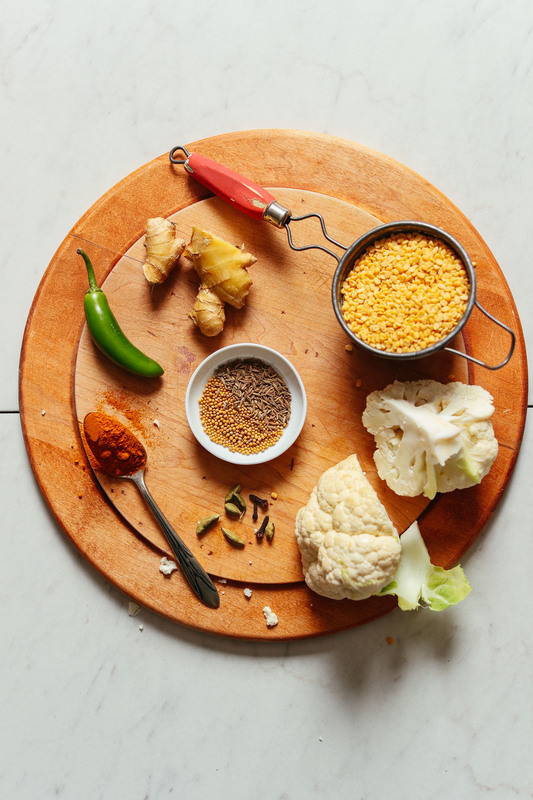 The recipe as its written is essentially cauliflower dal and in no way Ayurvedic. ALSO, unlike Khichri, this is probably a surefire way to get a gassy stomach if you eat it all on its own without a starch to balance things out, which again according to Ayurveda would qualify as dosha. Plant-based cooking is all kinds of awesome, as is this blog, but claiming Ayurvedic benefits and calling this khichdi/kitchari is really misleading. No issues with the dish as it is, I’m sure it’s going to be tasty, just that the surrounding info seems very misinformed. Avni, thank you so much for the thoughtful response. This recipe is certainly an inspired version and the main reason I swapped cauliflower for rice is that I wanted to provide a grain-free version of this dish. Many of our readers have dietary restrictions and sensitive digestion (myself included) and I thought cauliflower rice would be an easy swap that would allow them to enjoy this recipe. However, I did mention in the notes to use rice to keep it more traditional. We are always trying to provide the best recipes we can for our audience and appreciate any feedback that help us do so, so thanks for taking the time to share your thoughts. I will keep experimenting in the kitchen and continuing to learn and provide the best resources I can for our readers! Thanks for being part of this community. I am a practising Ayurvedic doctor and i can assure you that i would not advise pairing cauliflower with dals at all – it can create severe vata imbalance. Plant based diets as cooked in traditional kithcen have a lot of rules. 3) They balance inherent properties of the plant material with appropriate spices. Which is to learn the rules and experiment within the framework of rules. The same vegetable is cooked differently in the same region based on seasons.. So, there is great science that is passed on down the generations. Both of which always regarded terroir and seasons while cooking..
Actually the original version of this recipe didn’t contain rice – this was only added after the industrial revolution. I think the moral of the story is that things change as life does and labels aren’t really that important! Love the recipe! Moong and cauliflower sounds like a really good combination. In India we like to eat it with rice and a generous drizzling of ghee :) It’s a very reliable comfort food. I agree…The Kitchari spelling threw me off until I read the recipe and thought hey this sounds like Khichdi. I’ll have to try this version as Khichdi is one of our go-to favorites. Unaiza, thanks for pointing this out! I have tried “kitchari” or “khitchadi” out at restaurants and noticed different spellings and pronunciations there. In my research, “kitchari” seemed to be the most frequently used spelling, so that’s the one I went for. But thank you for letting me know, as well as about the pronunciation! It’s so helpful to me and other readers. Hi I really want to make this for my meatless dinners! I’m wondering where you’re getting your protein measurement of 15.7 grams from…like which ingredients are contributing to this? Looks sooo good! The major protein source of the recipe are the mung beans. The other ingredients have a little bit of protein too like the coconut milk, tomatoes, cauliflower etc. I think I only come up to about 45 g protein for the whole recipe, but I’m only estimating. I have never liked khitchadi much, but I love your recipes so much, I would try your version!! I’m going to make it for my mom and aunts one day! Thanks, Pooja! Hope you love our version!